Model MS-12 showing belt drive and demagnetizing coil. 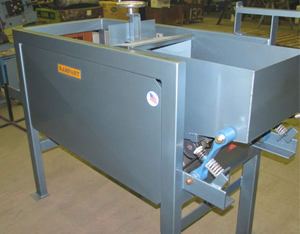 The Oakland-Rampart model MS-12 magnetic separator is designed to perform an accurate, automatic operation in the removal of ferrous parts from finishing media or other non-ferrous materials. By doing so the need for costly hand separation is eliminated. The magnetic separator may be used as a stand-alone unit, or in line with other equipment in your finishing department. 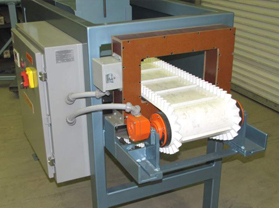 The magnetic separator utilizes an electromechanical vibrating feed box, with adjustable amplitude, to distribute a controlled flow of material to a drum shaped permanent magnetic pulley that pulls any ferrous material up and out of the media mixture. A cleated belt, with sides, moves the parts away from the magnetic pulley through a demagnetizing coil, to remove any residual magnetism the parts may have, prior to discharge. Oakland-Rampart magnetic separating equipment comes standard with a 12" wide belt, other sizes are available on special request. The machine may be set up for fixed or portable operation with the use of optional casters. Feedbox (total volume) is 3.5 cubic feet. 12" cleated belt with sides. Permanent magnet pulley. Demagnetizing coil. Feedbox, variable amplitude vibratory drive is 1/4 hp utilizing additional weights to adjust the amplitude. The belt drive is a 3/4 hp drum motor with electronic variable speed from 0 to 125 rpm by a simple pushbutton adjustment on the VS drive. The system voltage is 220/440v 3ph, 60hz, the voltage must be specified with order. Overall height of the machine is 50-1/2", length 76" and width 37-1/4".